My tween niece asked me for some design help. Even though it is the middle of summer, she is already looking ahead and planning on how she will decorate her first school locker. I remember how much planning I put into designing and decorating my school lockers to make sure everything was just. right. So I poked around for locker decorating ideas and came up with LLZ by LockerLookz. LLZ is the original brand of high fashion locker decorations developed by two moms who started making decorations for their daughters, and later their friends, with the highest quality products. I could say I decorated my gym locker as a testing ground for my niece’s locker. The truth is I could use extra motivation for going to the gym and pretty spaces motivate me. Also – LLZ uses heavy magnets to attach everything to the locker. It looks like a little apartment! I’m a little ashamed I didn't think about using magnets when I decorated my school lockers back in the day. I used double sided tape. My school didn't want us to use tape and several other elements that are now not an issue if you decorate with LLZ by LockerLookz. LLZ designs their locker decorations to be school locker rule compliant. It is probably going to shock you, but I did not decorate my locker in chartreuse. This is my personal wonderland space. I do not have to share it with a boy. I used a more feminine fuchsia and turquoise color palette. I added a little fun by mixing and matching LLZ prints starting with the fuchsia zebra print locker wallpaper. LLZ is designed to mix and match. That’s what my niece wanted my help with for her interior locker design. There are so many colors to choose for the wall paper, storage bins, locker lights, memo boards, picture frames and mirrors. She wants to choose wisely because the magnets will allow her to reuse them each year. LLZ decorations fit most standard size school lockers. Don't worry if your locker is a non standard size like mine. You can easily cut LLZ locker wallpaper to size using the grid on the back. I didn't have to use the perforations to keep the area around the door locking mechanism free but I think it is brilliant because that’s another reason my school didn't want us hanging stuff inside our locker doors. Given the size of my locker door, I didn't use all 12 of the heavy duty magnets that come with the LLZ wallpaper to keep it in place. I accidently found out if I strategically placed some of the other magnetic decorations and organizers they will keep the wallpaper right where I want it. I added a storage bin to the door to hold my cell phone while I work out. I can toss an extra hair band and ponytail holder in there too. The mirror is so I can check my look before I leave the gym. If I had the room, I would add a locker shelf that is is guaranteed to keep my gym bag clean in case of wet outdoor shoes. Instead, I added a turquoise locker rug. It’s pretty, yet practical, because it absorbs rain or snow on the outdoor shoes I change from and keeps the rest of the stuff in my locker dry. It also covers the nasty and rusty metal floor of my locker. LLZ locker chandeliers don’t come with batteries already installed. They shouldn't burn out quickly because the chandeliers have a motion sensor setting. Cool! I added some personality to make my inner diva happy with a blue locker chandelier to tie in with the blue locker rug. I replaced one of the LLZ wallpaper magnets with a fun flower magnet for balance. My gym shoes are made from recycled plastic bottles. I like to keep it green when I can. What do you think of my decorated gym locker? 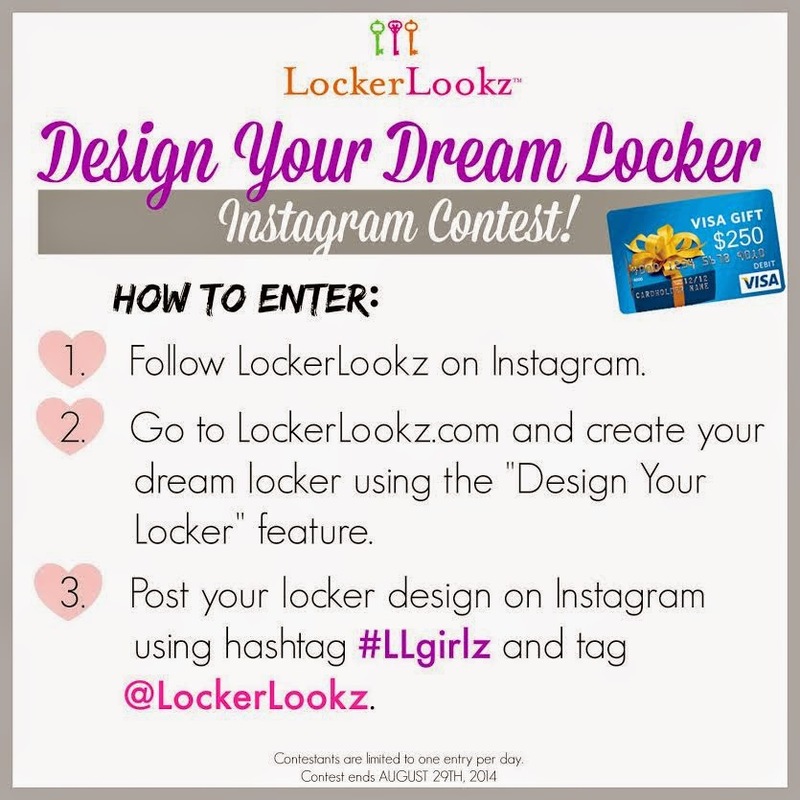 Design Your Dream Locker Instagram Contest! LLZ by LockerLookz wants to help you start the new school year right. The Grand Prize is a $250 Visa gift card for a back to school shopping spree! The Design Your Dream Locker contest starts July 5,2014 and ends August 29, 2014. Find the official contest rules: Find the official contest rules here. 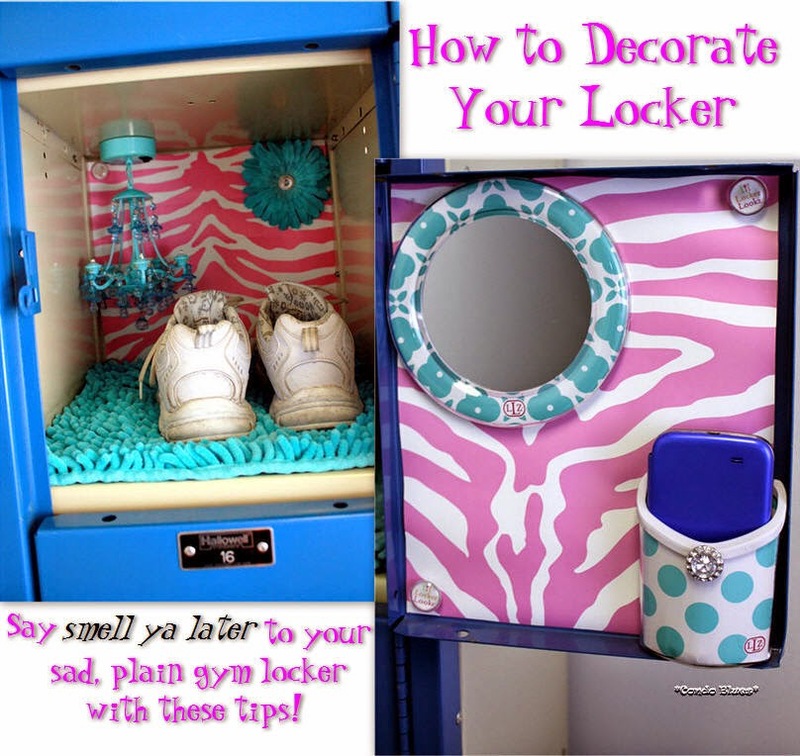 For more LLZ locker decor ideas, check out the clever blogs below! Disclosure: LLZ by LockerLookz provided samples to facilitate this post. This did not effect my opinion as they are always 100% my own. I also went ga-ga over the locker chandeliers on my own.